Join us on Monday 29th April from 11am to 12:00pm (BST) for our latest legislation webinar, bringing together specialist regulatory law practitioners who will be looking back on recent legislation changes, and forward to upcoming ones. 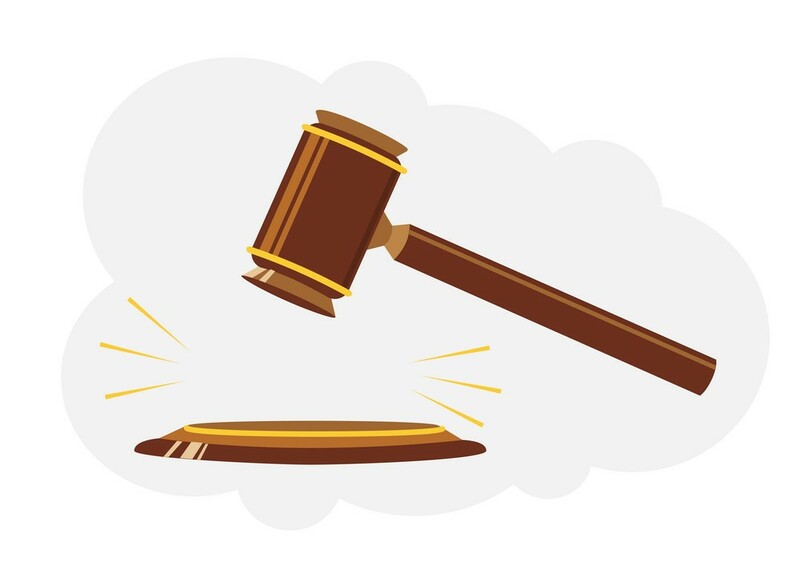 Health and safety law and securing compliance remains to be an ever important and far reaching area, particularly now in light of unlimited and ever-increasing fines. So register now and don’t miss out! 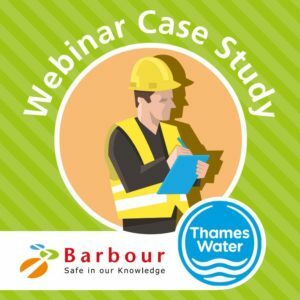 Find out why you should tune in or take part in the Barbour webinar series from Stephen Reeve of ARMS Reliability and Sarah Hurcombe of Thames Water. Both of which use the webinars to communicate with their audience and boost learning within their teams respectively. 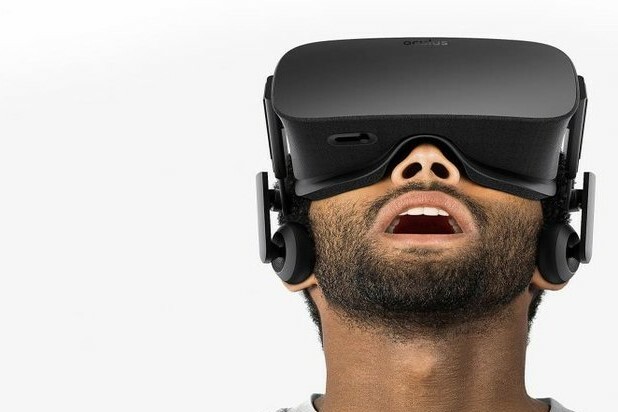 In our March webinar, the expert panel looked at how disruptive technology is changing the way health and safety practitioners go about their work. They discussed; How virtual reality and augmented reality is reshaping safety training, Practical examples of how technology is being used at Thames Water, Safety and the digital revolution, Connected Buildings and Connected Safety, Future trends in Connected Safety and The role of the safety professional – a ‘future shaper’. During our February webinar, the panel discussed the changing role of health and safety and how the job may look in the future plus what skills and qualifications practitioners may need in years to come. Topics covered included; the perception of health and safety and what can be done to change its image, qualifications that may be required, how teams will be shaped, where does health and safety sit, is it with risk or is it with people?, How ISO 45001 has changed the role, demographics of health and safety practitioners and the role of women in health and safety. 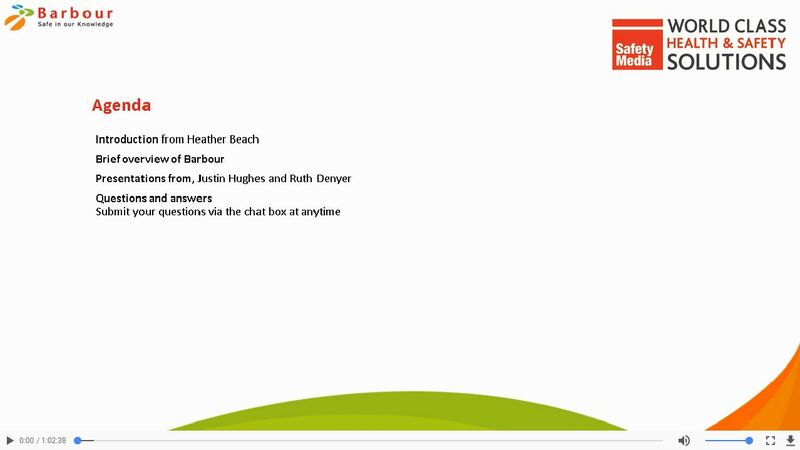 Our January Webinar, hosted by Ian Hart, focussed on Managing Workers Overseas. The expert panel included Mike Taylor, Director, SHEQ of Turner & Townsend and Katie Vickery, Partner at Osborne Clarke LLP, who discussed some practical examples of how to handle and manage overseas staff, how health and safety in the UK compares to overseas and an update on global health and safety standards. 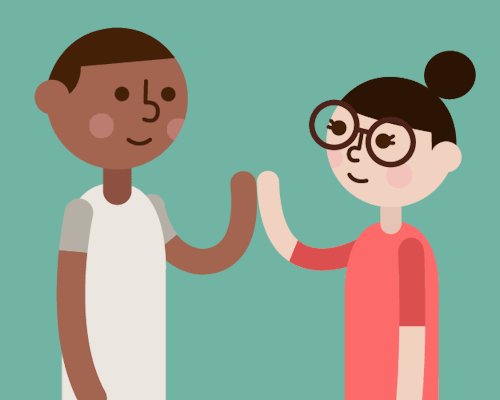 Our November 2018 webinar focuses on some practical case studies detailing how to deal with mental health in the workplace and some initiatives for how to improve the wellbeing of employees. The expert panel covers a whole host of relevant topics including; Mental wellbeing within the workforce, Health and Wellbeing in construction, Practical case studies and initiatives and Mental health training. Our October 2018 Barbour webinar, hosted by Ian Hart, SHP Online Editor welcomed Specialist regulatory law practitioners, Anne Davies, Partner and Business Crime Specialist at Gunner Cook, Simon Joyston-Bechal, Director at Turnstone Law and Louise Mansfield, Associate at Pinsent Masons. They were also joined by Howard Pullman, Business Development Director at Cority. The expert panel discussed past legislative changes and upcoming ones, plus much more. 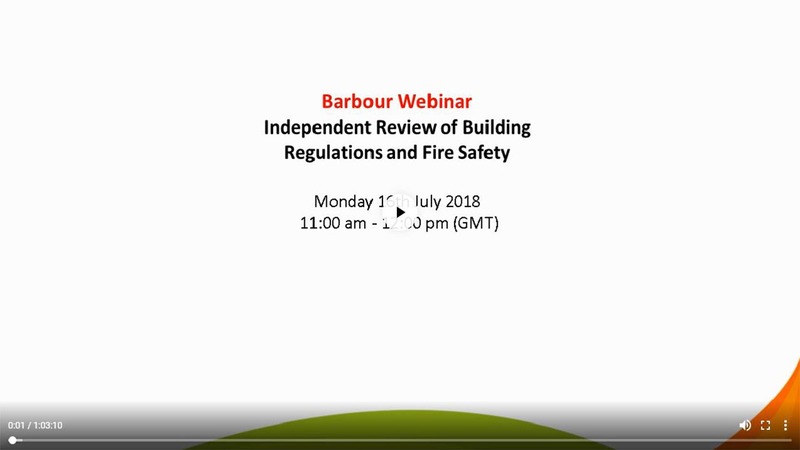 Our most recent Barbour webinar, hosted by Ian Hart, SHP Online Editor welcomed Anna Keen from Acre Frameworks, Simon Bliss of Principal People and Jenny McGrother from the University of Reading. The Safety experts discussed what makes a true leader, the ideal skillset of a health and safety professional, how diverse health and safety is and much more. 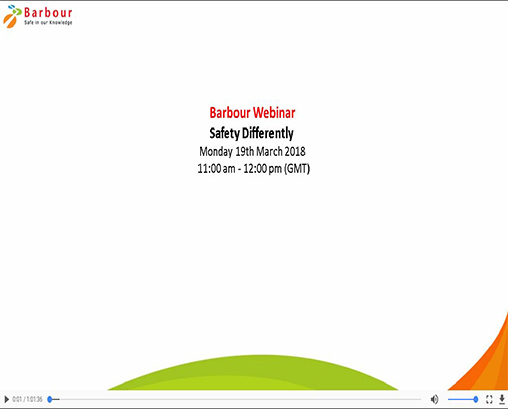 Our most recent Barbour webinar, hosted by Heather Beach of The Healthy Work Company, welcomed Dame Judith Hackitt. Dame Judith discussed her independent review which looked at ‘Building Regulation and Fire Safety systems in high rise residential buildings’, she also described her findings and answered questions about the review. 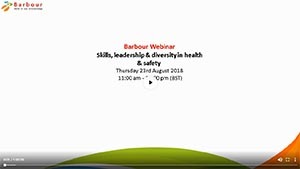 Our most recent Barbour webinar, hosted by Heather Beach of The Healthy Work Company, welcomed Justin Hughes former Red Arrows Executive Officer and Ruth Denyer from ITV. They discussed dynamic risk assessment and an exciting approach for TV productions that is relevant to any industry, all geared towards bringing the concept alive by using fresh and engaging approaches. 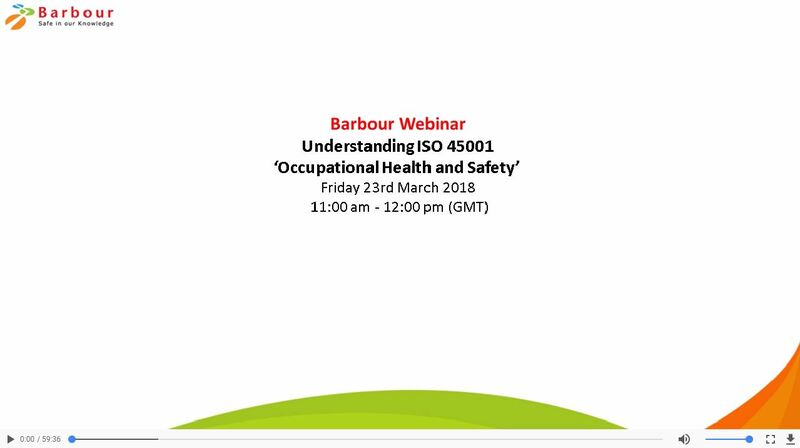 Our most recent Barbour webinar welcomed Kate Field, Global Product Champion for Health and Safety at BSi and Mike Taylor, Associate Director, SHEQ at Turner & Townsend. They discussed the brand new occupational health and safety standard ISO 45001 and how this new standard will affect us. Our most recent Barbour webinar welcomed Helen Rawlinson, Managing Director for Art of Work Ltd, Simon Bown, Head of Health, Safety & Environment at London Luton Airport, Chris Lea, Director of Wellbeing, HS&E & Responsibility at UCB and Lorene Carter, Lead HSSE Manager on the London to Corby railway electrification project. They discussed how ‘Safety Differently’ actually works in practise and how they are experimenting with the different approaches. 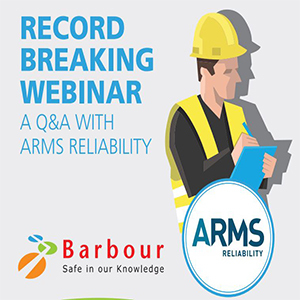 Our most recent Barbour webinar welcomed Stephen Reeve and Steve Vardy, both from ARMS Reliability. 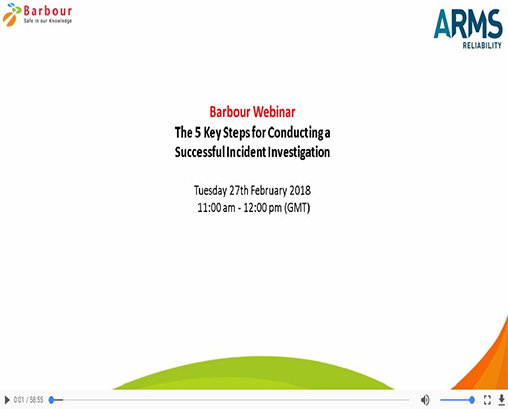 They discussed the five key steps of an incident investigation which precede the actual analysis, as well as the important considerations within each step to ensure a thorough and successful investigation. 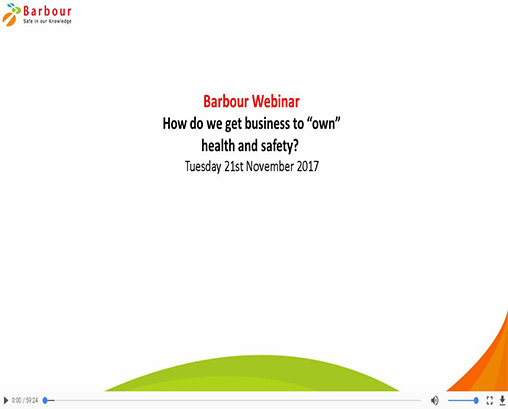 Our most recent Barbour webinar which was hosted by Heather Beach of The Healthy Work Company, welcomed Dame Judith Hackitt Chair of EEF and SEMTA and Professor Andrew Sharman, Vice President at IOSH. They discussed how you can lead and manage health and safety efficiently and effectively, by sharing with you just what your MBA should have taught you about workplace health & safety.